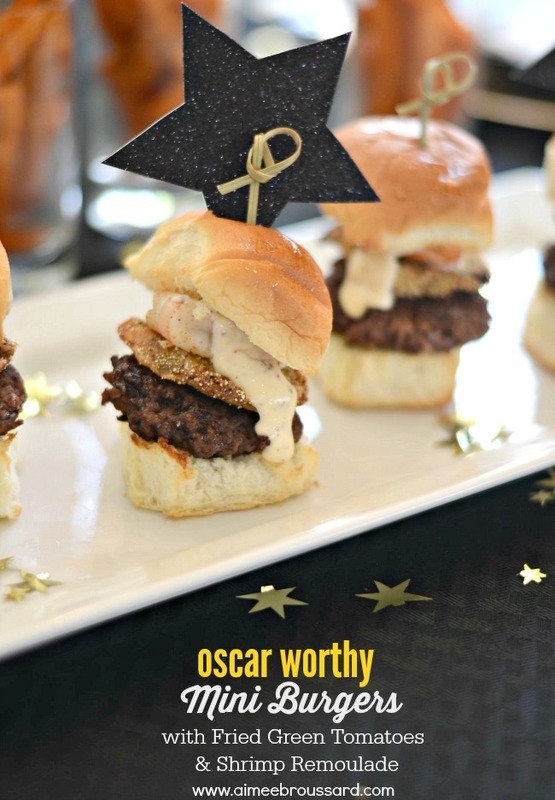 Before we discuss the Oscar Worthy Mini Burgers featuring Fried Green Tomatoes & Shrimp Remoulade, let’s acknowledge that now that the Super Bowl is no longer lingering over our heads, we can shift our attention to more important matters….awards season! My husband and I have a trade off. He can monopolize the television for the big game, and I can toss him out while I take over the big screen and host a Girls Night In Oscar Party. The Oscars is the perfect opportunity to round up your girlfriends, pull out the glitz and glamor, serve some delicious snacks while sitting back, sipping champagne and chatting about the fashion. 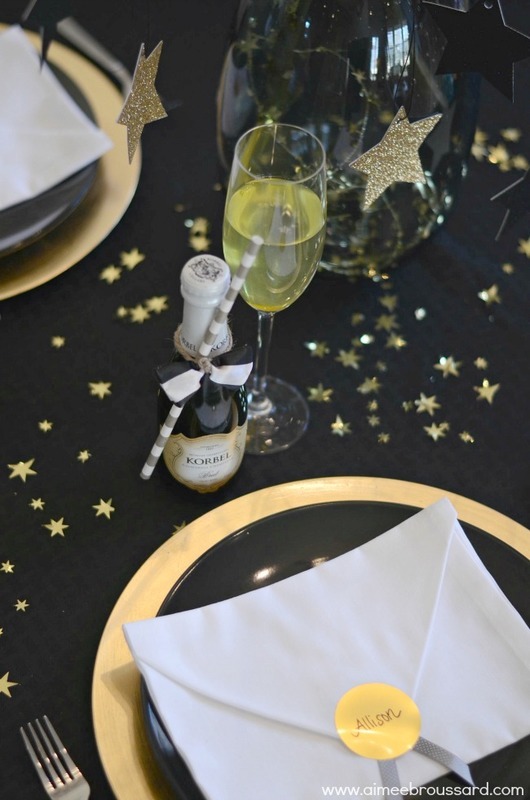 If you’re a fan of sparkles then setting the table for your Girls Night In Oscar Party will be a lot of fun. This is the night to pull out the gold glitter! 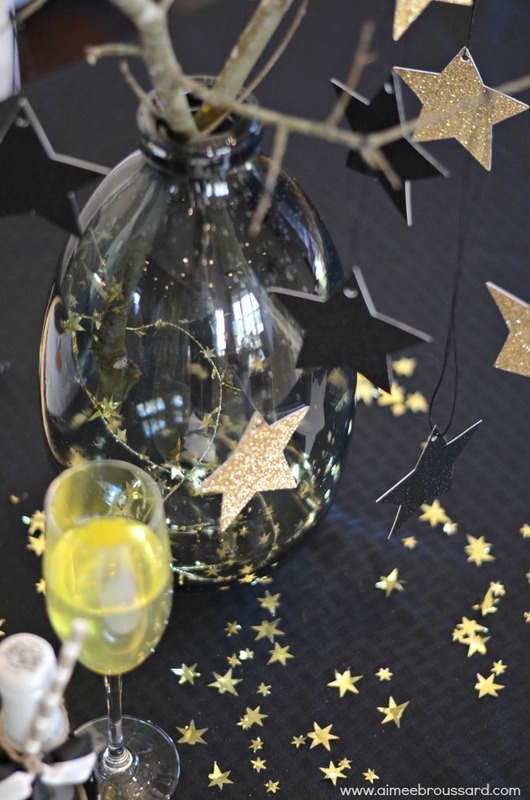 Going for a rustic glam vibe, I hung black and gold glitter stars from tree branches placed in a decorative vase and used as our centerpiece. The dangling stars lend way to the star studded night. Simply draping your dining room table with a black tablecloth instantly increases the classiness of your event and allows your gold confetti to really pop. Those award envelope napkins you spotted on Pinterest? Now is the time to use them as place cards for your guests of honor. Incredibly easy to make and creates a personal touch….and directs everyone where to sit. No men in attendance means Mr. Champagne is the man of the hour. Dress him in his Oscar Night best by hand making a striped satin bow tie. 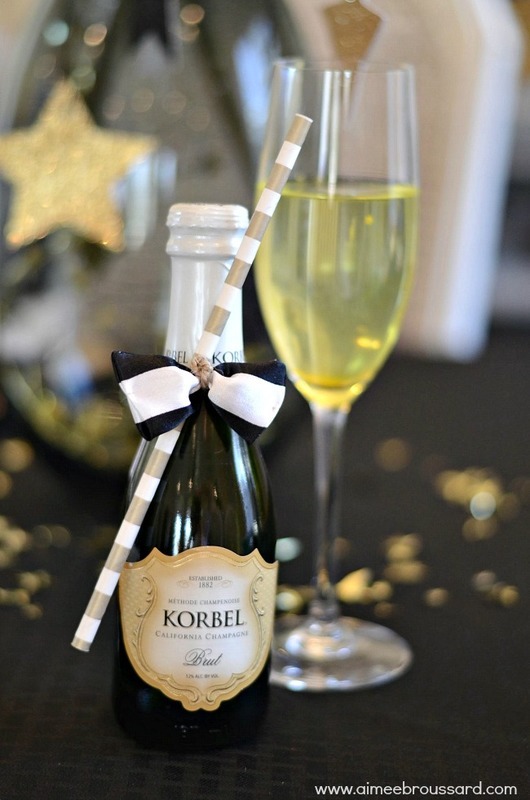 Attach a gold striped straw for easy sipping. Now that your table is set, move on to your menu. Appetizer style food is the way to go here, but that doesn’t mean you can toss chips and dip onto the table. You need at least one option that will be your signature awards night dish. 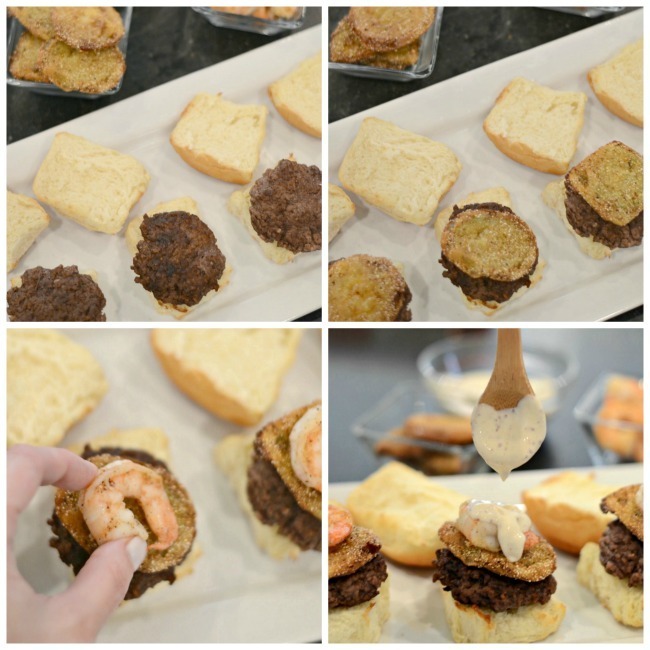 These Oscar Worthy Mini Burgers featuring Fried Green Tomatoes & Shrimp Remoulade will win you the award for most memorable hostess. It’s as if anything and everything southern got married and had a baby on a King’s Hawaiian Roll. We all know that a delicious slider/mini burger starts with the bun and there is no denying the sweet, fluffy, irresistibleness of a King’s Hawaiian roll. It sets the stage for the insanity that is about to occur with our mini burgers. Begin by cutting in half your desired amount of King’s Hawaiian Sweet Rolls and bake in the oven directly on the rack for about 5 minutes, just long enough to get a little bit of a toasted exterior. Once the buns are toasty, you’ll need to get your assembly line ready. I had the husband work on the mini burgers, shaped to the size of our King’s Hawaiian Sweet Rolls. Set those aside. Saute your thawed, peeled, deveined shrimp in just butter and Creole seasoning and set those aside, too. Whip together your homemade remoulade sauce. Combine ingredients together in a medium bowl. Chill. Store in airtight container in refrigerator until ready to use. Now, let’s get your fried green tomoatoes ready. Combine half of the all-purpose flour (1/4 cup), cornmeal, 1 teaspoon salt, ½ teaspoon pepper and ½ teaspoon of cajun seasoning and pour into a shallow pan. Dredge the tomato slices in the remaining ¼ cup flour and then dip into the egg mixture and then into the cornmeal mixture. Pour vegetable oil to a depth of ¼ to ½ inch in a large cast-iron skillet; heat to 375°. Drop tomatoes, in batches, into hot oil, and cook 2 minutes on each side or until golden. Drain on paper towels. Sprinkle with salt and additional pepper if desired. I don’t even like tomatoes but there’s something about a fried green tomato on a burger that entices me. And, there’s the movie reference so if you’re one of those that likes to connect a food with a movie, then you could call these the Fried Green Tomato Burgers. Are you ready to layer?!? Top it with a sauteed shrimp. Now drizzle your homemade remoulade. Top of the roll goes back on and you’re going to want to secure it with a skewer or toothpick to keep that little guy together. Warning: do not attempt putting these together on an empty stomach. 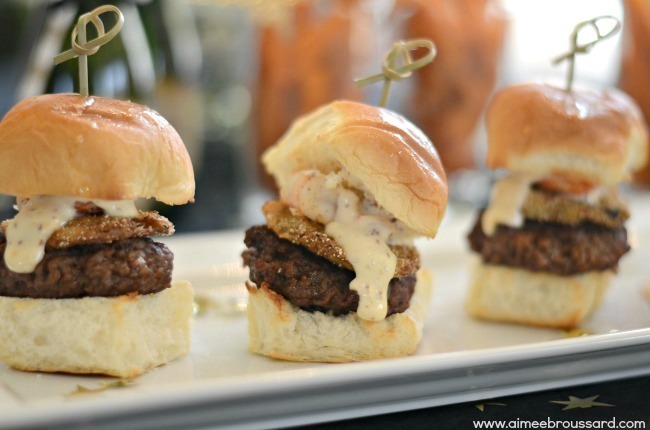 If you do and not all of the mini burgers make it to the party, you will have yourself to blame. You’re going to need at least 2 per person so keep that in mind when preparing. Did you know that simply placing your sweet potato fries in a glass juice glass or shot glass container will instantly glamorize your fries? It’s an easy and elegant way of serving an otherwise awkward food to serve. 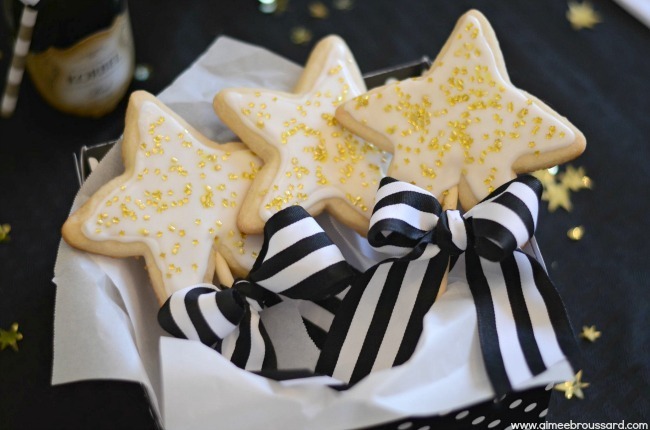 And last but not least, remind your girls how golden their friendship is by sending them home with their very own star cookie wand. Created by simply attaching a lollipop stick to the base of a sugar cookie, icing, sprinkling edible gold glitter and finishing off with a bow. Cookie wands might be my new favorite thing! 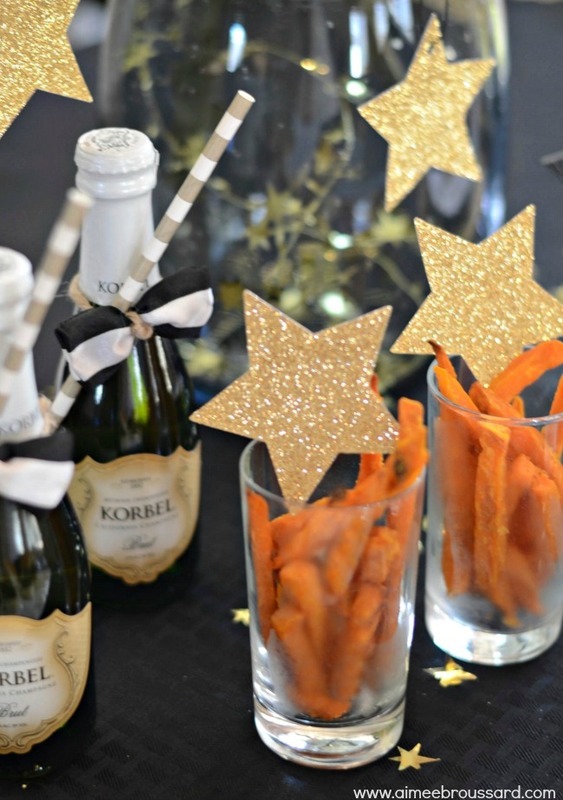 Need more ideas for hosting an Oscar Party bash worthy of rave reviews? Head over to King’s Hawaiian Starring Roll website where you’ll find more party planning inspiration, delicious recipes AND a chance to win $10,000! Do you know what kind of party you can throw with $10,000?! Please be sure to invite me if you win. Oh wow! That burger has everything and those cookies are too cute! So fun! Everything looks beautiful! How did you attach the lollipop sticks to the bottom of the cookies? Hi Mandy! These sticks had a pointy end so I just stuck them in right when I took them out of the oven and before they had a chance to harden. You’ll want to keep your cookies sort of thick, though so there’s enough to “hold” the stick. Hopefully that makes sense! This is so cute and creative, and it also seems delicious. I must try to make it. Thanks for sharing!